The Barracuda™ Intruder Defense System is helping keep classrooms and public buildings safe in the event of an active shooter situation. The Barracuda™ is a security device that can be installed in a matter of seconds in emergency situations to protect occupants against building intruders. The Barracuda™ Intruder Defense System was invented by Troy Lowe, a decorated military, who is currently a firefighter and SWAT team member in Ohio. As a SWAT team medic, he works to prevent these tragedies in his community through shooter response training programs. To learn more about this security device please take a moment to watch a short demonstration video as well as a newscast on how Southwest Licking Schools have put the device to the Barracuda™ to use. Washing your hands is one of the most important steps you can take to avoid getting sick and spreading germs to others. Did you know that many diseases and conditions are spread by not washing hands with soap and clean, running water? If soap and water are not available you can always use an alcohol-based hand sanitizer that contains at least 60% alcohol to clean your hands. Teaching kids early on the proper way to wash hands is super fun and easy with the Glo Germ™ Handwashing Training Kit. The Glo Germ™ Kit demonstrates germ communication, cross-contamination, effectiveness of sanitary practices, and more. Check it out at School Kids Healthcare. What Is Enterovirus-D68 and How Can I Protect My Family? Enterovirus D68 (EV-D68) is one of more than 100 non-polio enteroviruses. This virus was first identified in California in 1962. Every year millions of children in the United States catch enteroviruses, usually during summer and fall, however this year hospitals have been seeing more children with severe respiratory illness caused by EV-D68 since mid-August. Infants, children, and teenagers are at higher risk than adults for getting infected and sick with enteroviruses like EV-D68. Due to their age they have not been exposed to these types of viruses before, and they do not yet have immunity built up to fight the disease. Children with asthma may be at a greater risk for severe respiratory illness from EV-D68. Mild symptoms of EV-D68 may include fever, runny nose, sneezing, cough, and body and muscle aches. Severe symptoms may include wheezing and difficulty breathing. There is no specific treatment for EV-D68. You can protect your family in avoiding catching and spreading EV-D68 by following some basic steps to stay healthy. Cudahy, WI – September 8, 2014 – School Kids Healthcare (SKHC), a leading distributor of school nurse supplies and health room equipment, announced the addition of CPR RsQ Assist® to its growing line of medical supplies and equipment. “We are extremely pleased to partner with Joe Hanson and offer our customers a first-of-its-kind, FDA-approved hands-only device,” said Kim Alexander, Strategic Marketing Manager for School Kids Healthcare. CPR RsQ Assist® has easy-to-follow voice commands, along with an audio and visual metronome. It talks you through the steps of calling 911, placing the device in the center of the victim’s chest, and instructs you to push 100 times per minute until help arrives. To address fatigue, the product has an ergonomic design with an easy-to-grip, non-slip handle. The design allows you to leverage upper body strength and weight as you push down, delivering quality compressions in the center of the chest over minimal clothing, if needed. 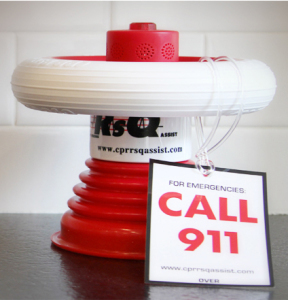 CPR RsQ Assist® is FDA-approved for use on people eight years of age and older. It is an essential safety tool to keep at home, in the workplace, in the car or anyplace where there are two or more people. The device is available with a custom-designed wall cabinet and signage for easy placement adjacent to an AED machine so rescuers have easy access to both lifesaving devices. The current American Heart Association guidelines call for at least 100 chest compressions per minute for at least two minutes prior to using an AED machine. For more product details, please visit CPR RsQ Assist Product Page. ¹Continuous-Chest Compression Cardiopulmonary Resuscitation for Cardiac Arrest Circulation. 2007:116:2894-2896. To create an even greater shopping experience for our customers, enhancements have been made to the School Kids Healthcare website that support responsive design, which allows optimal viewing across a wide range of devices, including smartphones and tablets. Users can easily navigate the site, view larger images, have more video viewing options, and quickly checkout using a variety of handheld devices. “We are extremely pleased to offer our customers more options to save on school nurse supplies and everyday products as well as improving the shopping experience through our website’s updated interface,” said Kim Alexander, Strategic Marketing Manager for School Kids Healthcare. Come check out our new look at www.schoolkidshealthcare.com.